Cream Pies (Georgie Williams). 6 eggs. 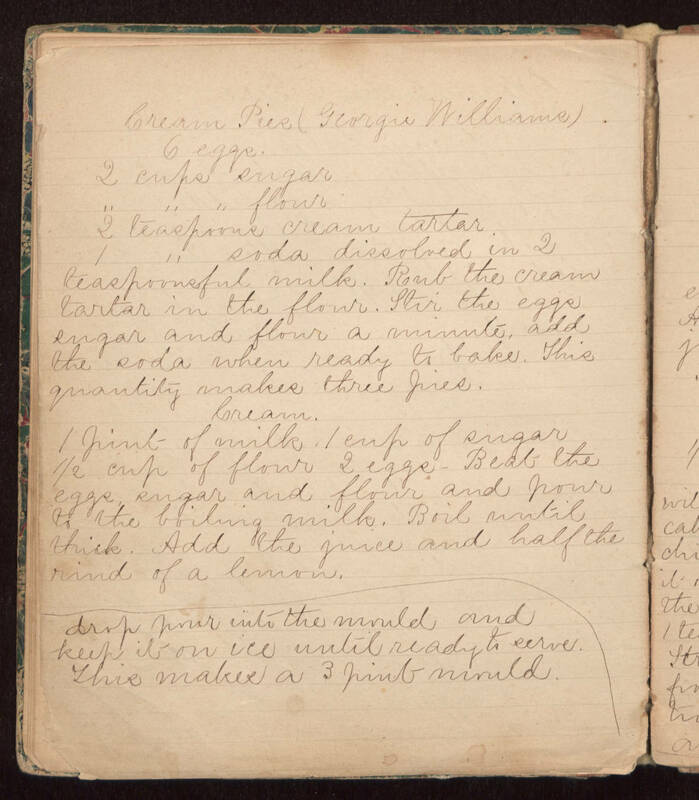 2 cups sugar " " " flour 2 teaspoons cream tartar. 1 " soda dissolved in 2 teaspoonsful milk. Rub the cream tartar in the flour. Stir the eggs sugar and flour a minute, add the soda when ready to bake. This quantity makes three pies. Cream. 1 pint of milk, 1 cup of sugar 1/2 cup of flour 2 eggs. Beat the eggs, sugar and flour and pour to the boiling milk. Boil until thick. Add the juice and half the rind of a lemon. drop pour into the mould and keep it on ice until ready to serve. This makes a 3 pint mould.